Note: I first published this blog using the acronym Earned Run Average (ERA) and Earned Run Differential (ERD). I have subsequently amended the acronyms to First Chance Average (FCA) and First Chance Differential (FCD). See: Random Analytics: Shane Watson First Chance Average (to Cape Town 2013/14) for the detail. David Warner’s recent form has been fantastic. Two centuries plus two half centuries in the Australian leg of the Ashes and one century plus two half centuries in the first two tests in South Africa are a good return. However I haven’t been completely convinced that Warner is in the best of form and while discussing the subject over a beer a mate of mine suggested using a Moneyball metric to test the theory. I could be wrong but here might be a cricket first, looking at David Warner’s Test Earned Run Average statistics (and thanks to Daryn Webster for the suggestion and Adrian Storen for the sanity check). 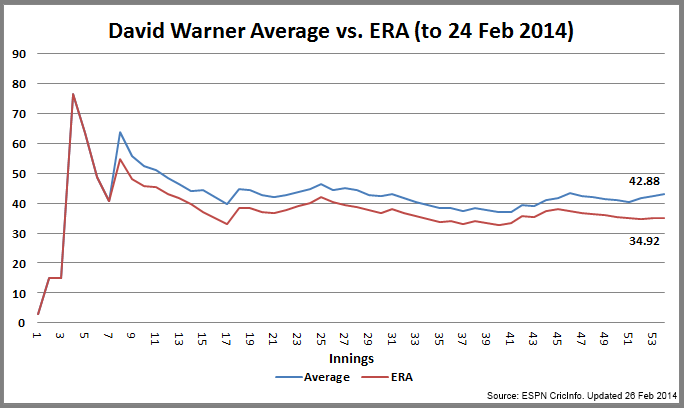 First chart looks at Warners standard Test average (currently 42.88 after a 70 and a 66 at Port Elizabeth, South Africa) versus his Earned Run Average which sits at 34.92 (-7.96). The Earned Run Average (ERA) is calculated using the score he would have got if a legitimate chance had been taken by the opposing team. In this case I’ve only had to consider dropped catches and missed stumping’s as legitimate chances but I could foresee a missed referral being added in the future. As an example in the 2nd Innings at Port Elizabeth, Warner was put down by Duminy in the 16th over on 36. Thus although he scored 66 for the match his Earned Runs were just 36. The next chart looks at Warners standard Test average for the Australian and South African summer series. Although Warner has had an outstanding summer with the bat his average over seven tests stands at 60.46 yet his ERA is a much lower 41.00 (-19.46). The final chart looks at two datasets. 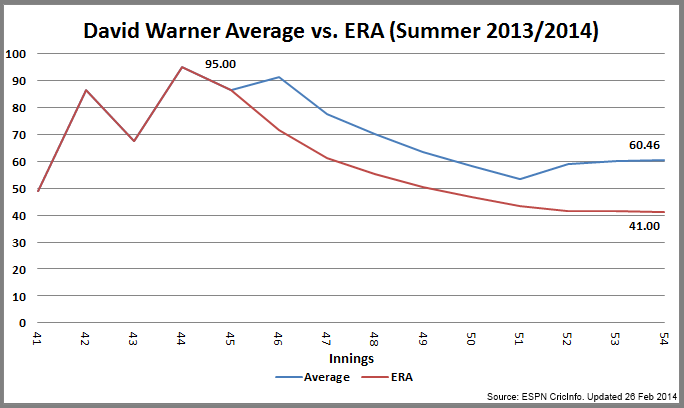 The first (in blue) is the Earned Run Deviation (ERD) which for Warner has increased from a career low of 8.8% at the start of summer to now hit a career high of 18.6%. The Earned Run Deviation (ERA) is calculated 1/Total Test Runs x Earned Run Deviation. In Warner’s case he has currently scored 2,187 runs but would have scored 406 less if opposing teams had of taken his offered chances. The second dataset (in red) are the chances that David Warner has been given. His summer 2013/2014 Earned Run Deviation is 32.2%. Australia’s coach, Darren Lehmann, when asked if Warner was too reckless has recently stated “That’s just the way he is, and we’re very comfortable with that“. Warner’s current form is excellent so any coach would be hard pressed to have to drop him. 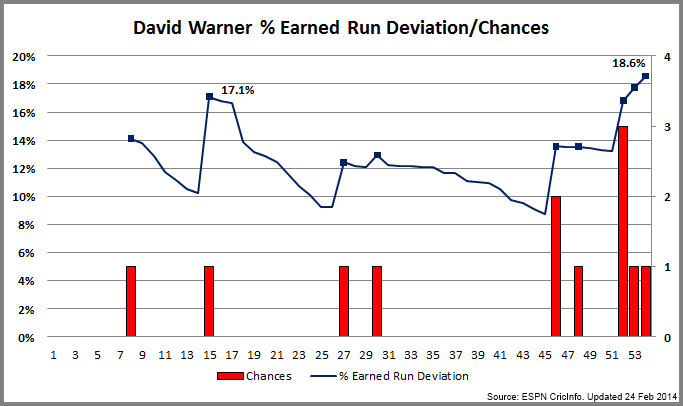 Saying that Warner’s Earned Run Average, Earned Run Deviation and Average Chances are all moving in the wrong direction. Unless he can turn that around in the short term he might find his luck running out. 6 Mar 2014: Updated title to First Chance Average and added note plus link to Shane Watson’s FCA.